We collaborated with a church committee to create this picturesque stained glassed window which sits above the alter. 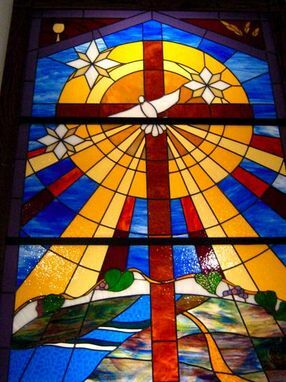 Early in the process of the church renovation, the congregation was asked to create a list of religious elements that they would like incorporated into a backlit stained glass window. Once they chose the elements, we carefully designed masterpiece of vivid colors conveying an aura of peacefulness and giving along life's path and around the world.